I have no clue where to start, and only a vague idea of where I’ll stop. Settle in, kids, this one may be rough. First, I’ll blame Michael. He got me interested in Bruins Nation, a sports blog for the UCLA Bruins, which is where he gets his Bruins sports trivia. I subscribed to their RSS feed (I’m not cool enough for a twitter feed), and that got me to thinking … how about my alma mater? Surely there is a sports blog dedicated to the University of Missouri? My Tigers??? Indeed there is: Rock M Nation. I began to read, and I am now awash in sports trivia for the two colleges’ teams I follow: Mizzou, where I went to school, and UCLA, where my money went. One post on Rock M Nation pointed me towards a novel that was set at Mizzou. It’s written by Michael Atchison, an alum that knows the guys at Rock M … come to find out, he’s a sports journalist who wrote a novel about music. And growing up. And being disappointed. In Missouri. I’m in. There’s an excerpt you can read, here. Meanwhile, back at the computer, I decided to upgrade my music consumption with one of those new fangled iPod thingies. The lovely Velda gave me one for Christmas. Perfect! I had a business trip coming up in January to northern Iowa (the high was 11* while I was there), so I could use the iPod on the trip. I proceeded to rip the soundtrack of my life. I believe in purchasing music, by the way. I have CDs and more CDs. I do not steal music. Haven’t purchased digital downloads, as I 1) had no place to put them and 2) I don’t like their inferior audio quality. I’m an audio snob. Get over it. So I made digital copies of music from Carly Simon, Jethro Tull, Tom Russell, Bread, Eastmountainsouth, Chicago, The Beatles, The Stones, Michael Jackson, Emmylou Harris, Norah Jones, Madonna, Hank Williams, Orleans, Martina McBride, Rosie Flores, Bonnie Raitt, Eric Church, Nikka Costa, Pure Prairie League, Clint Black, Nicolette Larson, The Wailin’ Jennys, Frank Sinatra, Wylie & The Wild West, Barbra Streisand, Led Zeppelin, Zac Brown Band, James Taylor, Danni Leigh, Amy Grant and Lady Antebellum. To name a few. I got on the plane with 11,000 songs. It was heaven. My iPod, my noise cancellation headphones, and my kindle. Three illegal items when the plane is taking off or landing, but, oh, when we were soaring … I was soaring. I pulled up my nascent playlists. Funk. Mellow. Western. Hits. ’70s. Country Stars. Yum. I had not had this level of aural control of my environment since I stopped regularly visiting my woodshop … where I have a great CD changer + sound system set up (OK, OK, my garage. But it IS my woodshop.). Unfortunately, my last woodworking projects were last spring, and life took some different turns since then. All good … but I now had my music back, and it was wonderful. On my way to Iowa, I finished my Poul Anderson series of 7 novels that collected the eon-spanning story that went from the Psychotechnic League to Domininc Landry into the Long Night that followed. Great space opera, classic, award-winning science fiction, but I struggled a bit to finish it. The series has been compared to the James Bond series (Ian Fleming introduced 007 to the world 2 years later). Same dashing hero, same damsel-in-distress conquests. Good stories, really, but not great literature. I was glad to be done. On my trip home, I didn’t know what I wanted to read. 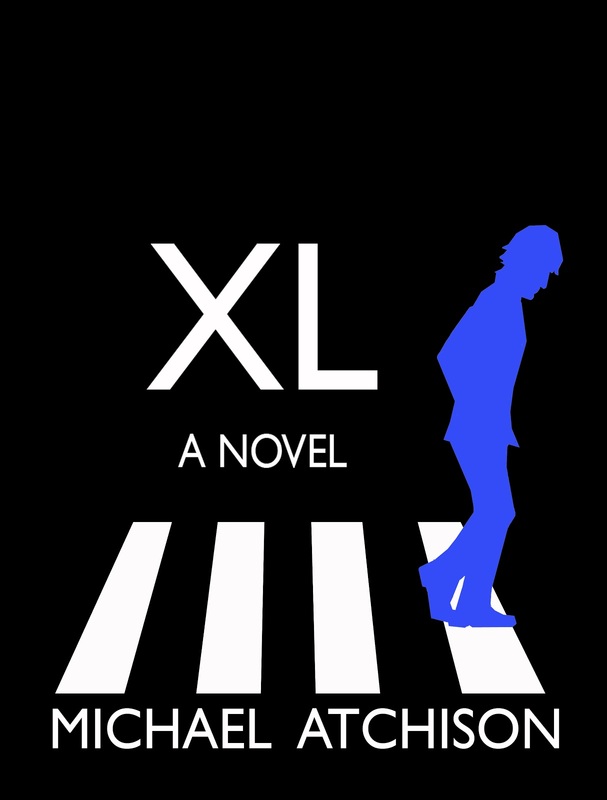 I had about 25 novels on the kindle … and I’d forgotten what XL was about. I needed a change of pace, though, and this unknown author looked like just the ticket. The music was a collection of favorites. I jumped around from mellow to party to western to country. But every tune, every tune, was a favorite. It was transcendent. And then the novel took me back, just as the music was taking me back, to the beginning of my college journey in Columbia, MO. In 1974, I found a creative release like never before … just as David Hankins did in XL. He met the love of his life, as did I. He had his dream yanked from him, as did I. His story might be more compelling than mine, but with my music in my ears, and his story in my heart, I was having a wonderful, wonderful trip. And then the book turned sentimental, with a character that believed in David dying, and then using his funeral to give even more support back to David. I sobbed. In the plane. Me. Sobbed. In public. Now, I’m not a walking puddle of emotions like Velda. Her profound leaking of tears at Christopher and Alley’s wedding became the stuff of legend. She’s probably still dehydrated, 5 years later. I am an emotional sort, and I’ve been known to shed a tear now and again. But in public, in the company of strangers, while reading a book? Not so much. Until I played my soundtrack, and read XL, and it was simply pitch perfect. XL’s about many things, but the engine that drives the book is music. The author says on his website that there are 209 bands & musicians discussed in the book. It’s about the music, and Hankins has the music in him. It’s a great read. You’ll meet David Hankins as he studies journalism at the University of Missouri. There were a few landmarks in the book that made me feel at home … but the novel could begin at any college, really. And when David went into the ’80s Goth underground club scene in Columbia I didn’t know if Atchison was kidding or serious. I mean … Columbia? A counter-culture? Really? Maybe it was there. I was so straight in the ’70s, I wouldn’t have known a counter-culture if it hit me in the face … which it did a couple of times, come to think of it. I finished the book after I returned home, and it did not disappoint. I wholeheartedly recommend it to you, whether you know Mizzou or not. In the end, the book is just about a guy, that loves a girl. They both love their family … and his music. This is Michael Atchison’s first novel, but I look forward to his next. Hope to see you around the Quad, Michael! The Columns are all that’s left of Academic Hall, which burnt in 1892. They are set in the middle of Francis Quadrangle, AKA the Quad. Roasting a chicken is one of the easiest and tastiest ways to make dinner. This is one of my best dishes, and is now a favorite of the family. Here is the recipe for my famous Lemon Roasted Chicken. Great recipe. You can do this! Remove the giblets and neck found in the cavity of the chicken and discard. Wash the chicken inside and out under cold water and pat dry with a paper towel. 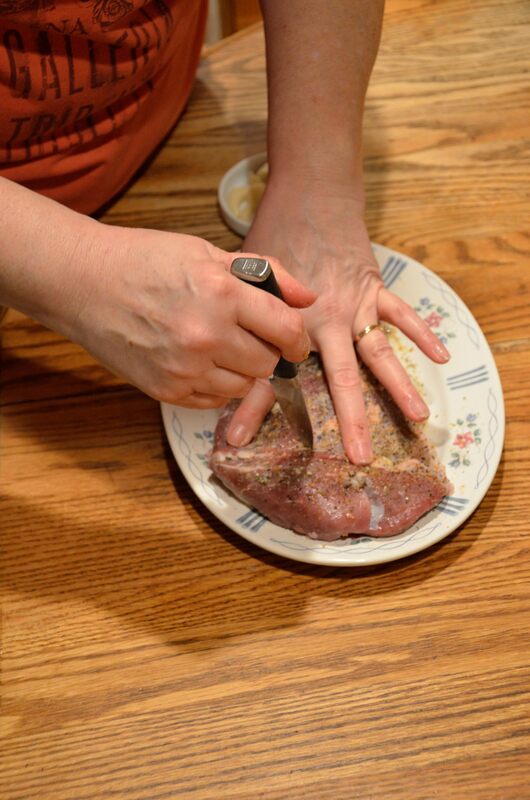 Insert a paring knife about 1/2″ into the breast of the chicken and push a clove of garlic into the hole you made. Repeat this all over the body of the bird, using 6 of the cloves. If you’d like, slice up the garlic into quarters and push the smaller pieces into the thighs and drumsticks. Squeeze juice of half the lemon all over the chicken. 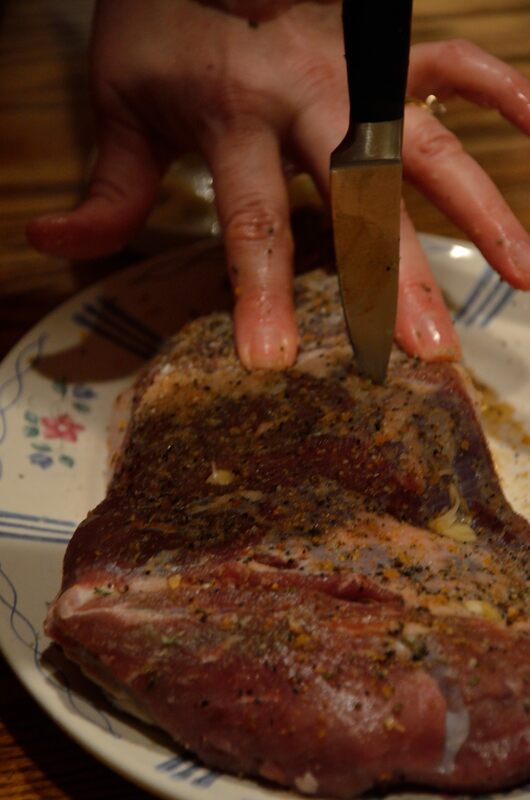 Rub salt and fresh cracked pepper into the skin. I then sprinkle the bird with Magic Dust, the special seasoning used on the steaks at the Hitching Post in Buellton, CA. If you don’t have any magic dust, use garlic salt. Finally, stuff the cavity of the chicken with the remaining garlic, rosemary sprigs, and half of the lemon. Make sure you cut it into slices first. Take the half you used to squeeze onto the skin, slice, and lay them in the bottom of your roasting pan. They’ll heat up in the oven and perfume the skin with a hint of lemon. Roast the chicken for 90 minutes. You’ll know when it’s done if you cut into the bird and the juices run clear and not pink. Take it out of the oven, cover it in foil, and let it rest for 15 to 20 minutes. 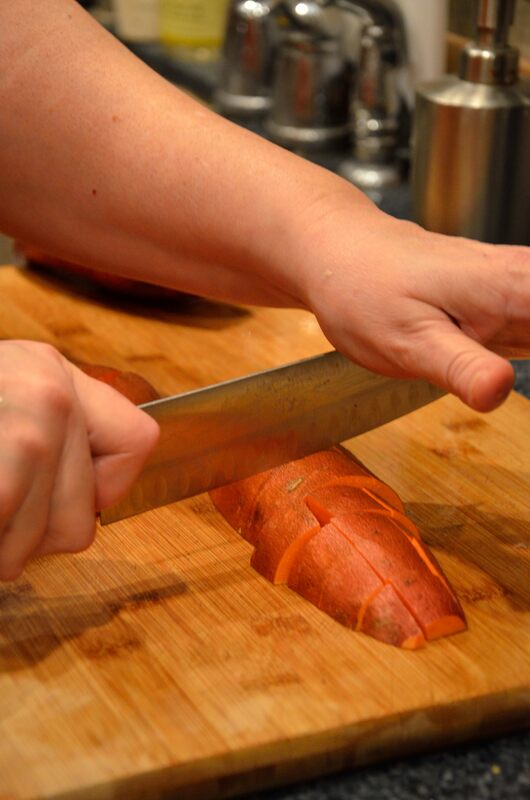 Carve and serve! A long time ago, not very far away, I began a phase in my life where I tried to cook. Things didn’t go smoothly. The food I made in my parent’s kitchen as a 13-year-old wasn’t good enough for the dog to eat, let alone my human family. However, I had to cook for someone in order to practice for my Foods class at school. My poor family suffered (Don’t let me make cinnamon rolls. EVER.). Anyway, after I passed this junior high elective (How? I still don’t know. Thank goodness for group work. ), I gave up any hope of learning how to cook…until I met my future mother-in-law. As Henry has mentioned before, Velda is a wizard in the kitchen (He might have given her other titles, but I lean towards the spell-casting folk. Personal preference, if you will). We’ve spent many a night packed around the kitchen table, eating to our hearts’ content. When our family of ten (now eleven!) 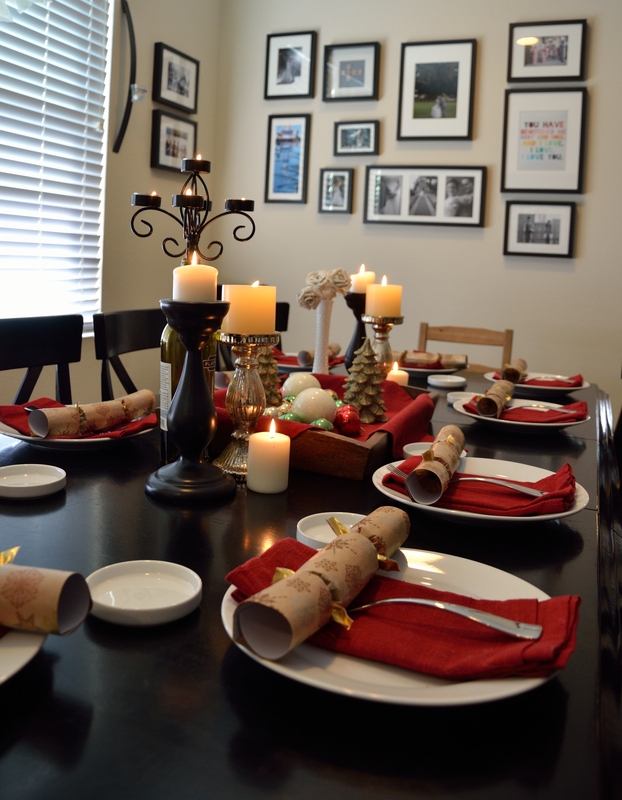 gathers for a meal, we need two sets of bowls for each side dish. Otherwise, it would probably take 20 minutes to get a single bowl passed around the table! The conversation is filled with jokes about making sure there is a bowl of mashed potatoes set aside specifically for me, or casting family votes on some silly topic (usually not in my favor). We watch as Christopher gets all of his food last (usually Lauren has already cleaned her plate). At meal’s end, we help move empty plates to the kitchen and congratulate Velda on another great meal. Our star chef loves the praise, but doesn’t always want to be alone in the kitchen. This is where I came in. I began my part in the Mowry Cucina as a sous-chef. I did small things like chop garlic and mix sauces. Occasionally I would season chicken or man the stir-fry. Though my jobs were small, it felt important and I enjoyed doing it. When Michael went away to college, Lauren and I spent time in the kitchen with Velda learning how to cook. We started the clamor for VMICA: The Velda Mowry Institute of Culinary Arts. Later, Jeremy and Michael joined the crew and started cooking. That didn’t last long, but it was definitely fun! Lauren and I were the first graduating class. As we got more confident we did more complicated things. I would make a side dish, or bake some rolls. Lauren would make sauces or put together salads. When Velda hurt her back at work and couldn’t cook, I was named temporary chef. I remember the first meal I made … it was awful. I put way too much raw garlic in the potatoes. Overcooked the chicken. Burnt the broccoli. It was a Murphy’s Law type of dinner and everyone ate it. They were too kind. It still haunts me. Years have passed since that day and I like to believe I’ve gotten much better. I love to cook. I’m not amazing, but hope I get an “A” for effort. I have my own set of signature dishes that the family enjoys, and I torture my husband with my cooking at home. Since we’ve gotten so focused on losing weight, finding ways to make healthy meals that taste good has been very difficult. You never know how much whole milk and real butter make a dish taste amazing until you can’t use them. But sometimes, the point of making dinner isn’t to impress your guests with your cooking, it’s to spend time with the people you love. I know that’s cliché, but it’s true. We spend our entire family dinner laughing, telling stories, talking about our lives. We make faces at our beautiful niece and mock each other endlessly. Eating family dinner happens two or three nights a week, which is rare for most families. Before college, family dinner was five nights a week. We’re lucky the food is great, but we’re luckier to have each other. I cook because I love to assemble ingredients and go grocery shopping. I cook because I love food. But, mainly, I cook because I love to have a reason to surround myself with my friends and family. I am a thirty-something wife, mom, and writer of historical fiction. When I’m not busy working on what is sure to be the finest novel my mom has ever read, I blog about history, one quirky anecdote at a time. And she does … today’s summary of the history of Erector sets, along with the U-238 Atomic Energy Lab play set from the same manufacturer, is a great read! Please enjoy! What is your favorite color? It keeps changing. Must be about aging. Green. What is your favorite animal? Homo Sapiens. What is your favorite number? Pi, as it defines an unending circle. What is your favorite drink? Diet Coke. Wait. Whiskey. Wait. A Cadillac Margarita. Wait. Diet Coke. Wait. Elijah Craig 18-year old Whiskey. Wait. Diet Coke. What is your passion? When you do something, do it right. Do you prefer a good movie or a good book? No question: a good book. Would you rather give or receive a gift? Why is that a choice? Both, please. What is your favorite day? Again, it keeps changing. It used to be Wednesday, but now it’s Saturday. What is your favorite flower? Hibiscus. So complex, so fragile. Other than the practical historian, I want to nominate some of the blogs that I most enjoy reading. They run the gamut from photography to recipes to humor to armchair philosophy. Some are new, some are less new. Some post daily, and some are less frequent. All are great blogs. I hope you’ll enjoy them, too. And, in no particular order…. Benjamin Harrison was 7 years old at the time of his Grandfather William Henry Harrison’s inauguration as President, but he did not attend the ceremony. In His Words: “”Come on, boys! We’ve never been licked yet, and we won’t begin now.” – at the battle of Peach Tree Creek. Not true: His Great Grandfather was a signer of the Declaration of Independence, and his Grandfather was President … but Benjamin Harrison was not born into a life of privilege. He grew up on a farm in Ohio with his father. His first school was a small log cabin, where he sat on seats made of planks with no backs, and so high that his feet did not touch the floor. He only attended school in the winter, as in the summer he had to work on the farm. True: Although he could warmly engage a crowd with his speeches, he was cold and detached when speaking with people on an individual basis. 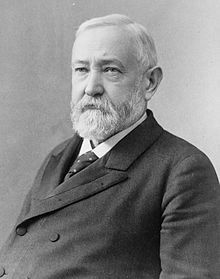 Benjamin Harrison had the White House wired for electricity, but he and his wife would not touch the switches for fear of electrocution. The frequently slept with the lights on. 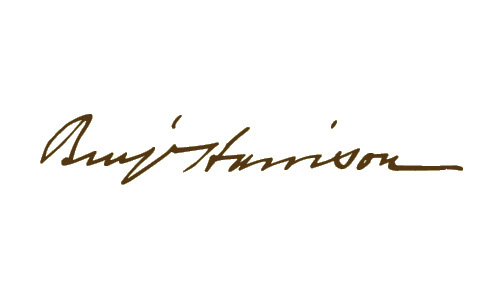 Six new states were admitted to the Union during Harrison’s tenure: North Dakota (1889), South Dakota (1889), Montana (1889), Washington(1889), Idaho (1890) and Wyoming (1890). Harrison was, regretfully, America’s last bearded president. 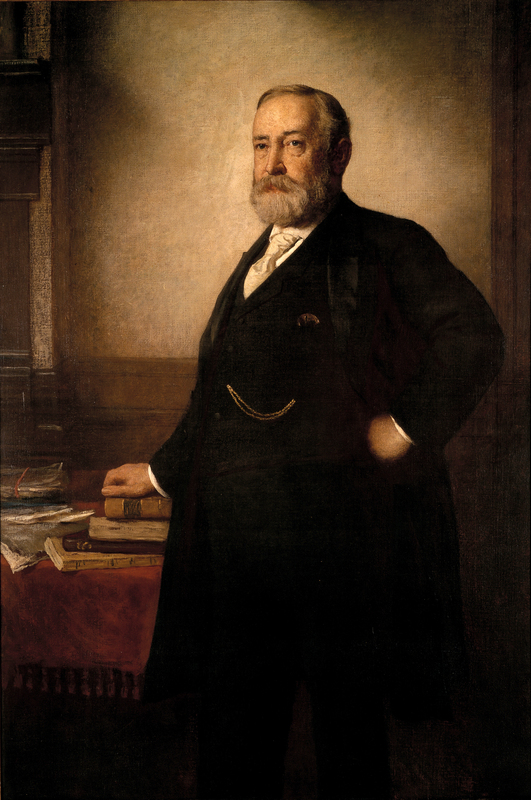 The Official Portrait: Eastman Johnson painted the official White House portrait of Benjamin Harrison in 1895. He also painted the official portrait of Grover Cleveland, who both preceded and succeeded Benjamin Harrison as President of the United States. Johnson was a co-founder of the Metropolitan Museum of Art in New York City and is best known for his portrayals of everyday people. This charcoal and chalk sketch on paper is owned by the National Portrait Gallery, and is thought to be an early working drawing for the painting that now hangs in the White House. 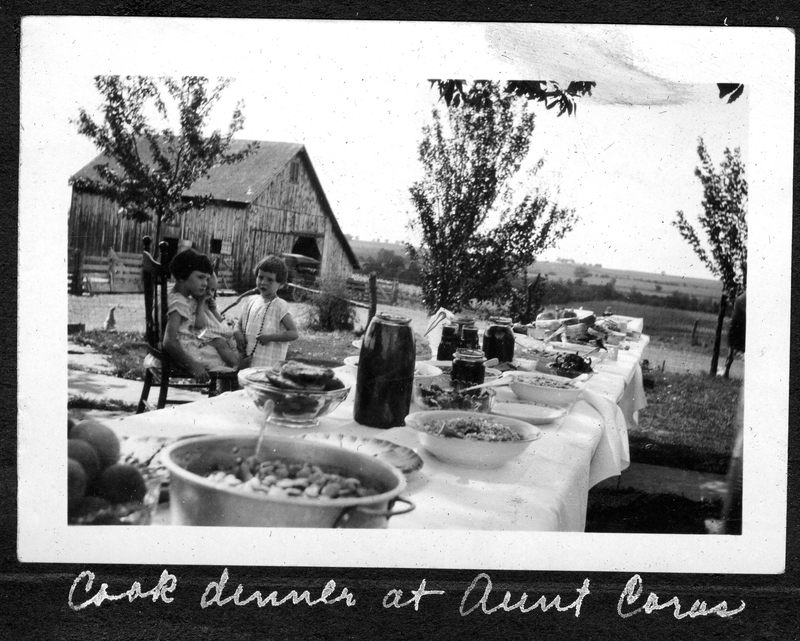 Dinner at Cora Cook Baugher’s home, circa 1930. This would be my Great Great Grandmother. I wrote the title of this post MONTHS ago. I was thinking about doing a commentary on obesity in schools and completely forgot what inspired that decision. As I was going through drafts and came back across this post, I realized it applies to something completely different…myself. Last week I joined Weight Watchers. A while ago my doctor told me I needed to shed a few pounds to help my heart health (I have a heart thing. It’s not serious. We don’t think.) and the things I tried at home weren’t working. So I gave in. The program is simple. Using a top-secret algorithm based on your age, height, and weight, WW gives you a number of points to spend on food every day. Veggies and fruits are free. Carbs have an inflated cost. So does wine (sad face). The website has meal ideas, recipes, and helps you keep track of all the points you’re working with. It’s pretty great. What I’ve noticed is this: being forced to write down what you eat is enough to change your eating habits. If you want to lose weight, start there. If you write down all the foods you eat for one day, you’ll be surprised. You’ll feel guilty about eating potato chips or going out for burgers. With that alone I could completely change my diet. But that isn’t all of it. It’s the pride in noticing the good foods. This week I’ve had five servings of fruit or veggies every day. I don’t know that that’s ever happened to me. Pair that with five trips to the gym this week and suddenly you’ll not only feel better, but look better too. More annoying clichés, I know. I’m lucky that being overweight has never really been a huge issue for me. An errant 15 pounds has chased me around since I graduated from college. Those last two years were probably the most stressful in my life (hence the heart issues). But beyond that I’m a pretty active person. That isn’t always enough. Looking ‘good’ and being healthy are two completely different things. I love my curves, but I haven’t been healthy. Changing my bad habits was surprisingly easy. Eating better is not only good for you, it feels amazing too. I lost nearly three pounds this week. It’s a small hurdle, but a hurdle nonetheless. And I’m proud of that. I’m proud to have cooked some tasty, low-fat chili. I’m proud of how hard I’ve worked out. The pride helps with weight loss too. Celebrate all the small steps and suddenly being healthy is a habit and not a diet. It’s not a chore, it’s enjoyable. It’s wonderful. Heat grill to high, approximately 500-600*. If your grill has multiple burners, you will be cooking on the unlit side to get indirect heat. Season beef liberally Montreal Steak Seasoning and garlic powder. Allow to sit at room temperature for 30-45 minutes. 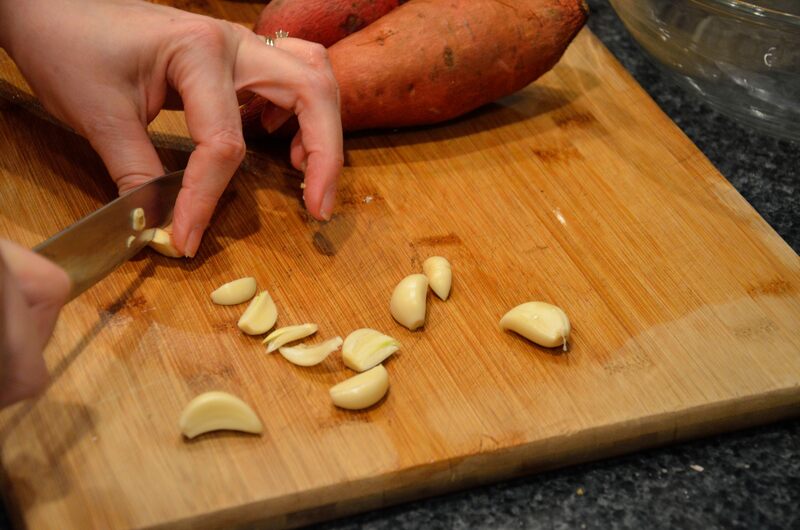 Peel garlic cloves and cut in half. 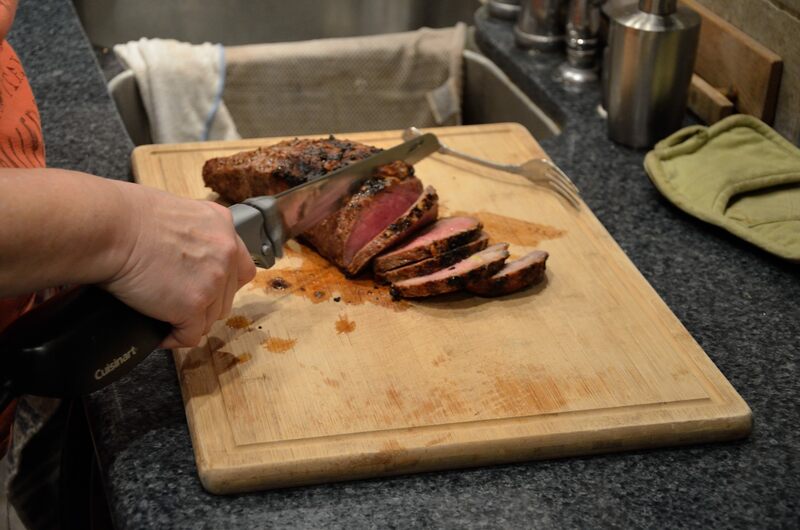 With a sharp paring knife, pierce tri tip to a depth of approximately 3/4″ and insert garlic cloves approximately every inch. Drizzle with Worcestershire sauce. 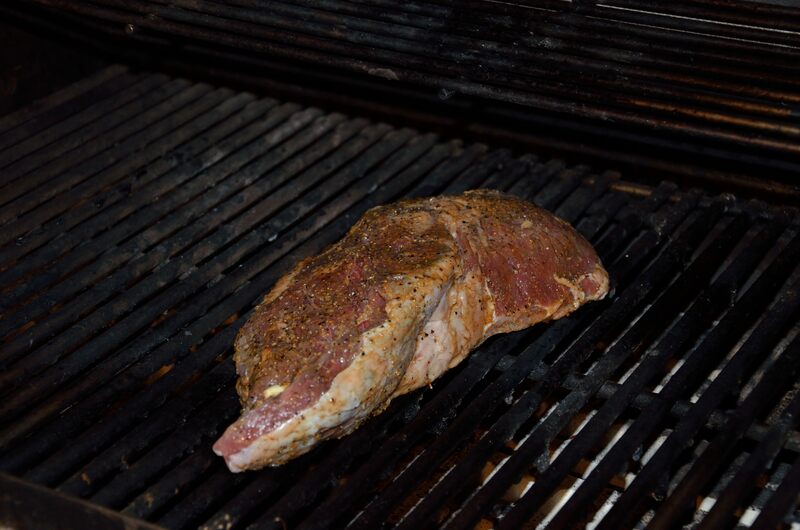 Place the tri tip on the hot side of the grill and sear for a few minutes on each side. Then, move the tri tip to the unlit side. 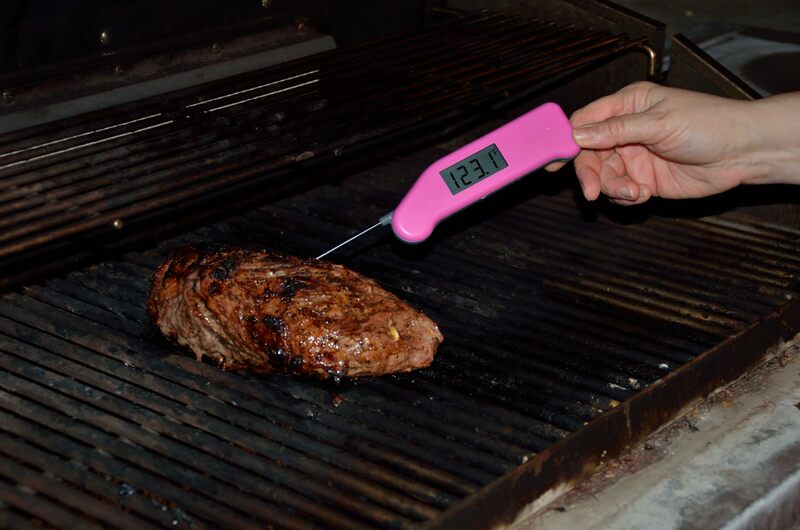 Cook an additional 20-30 minutes, depending on the size of your tri tip to medium rare, or 140* on your instant read thermometer (Velda recommends the Thermapen, available here). 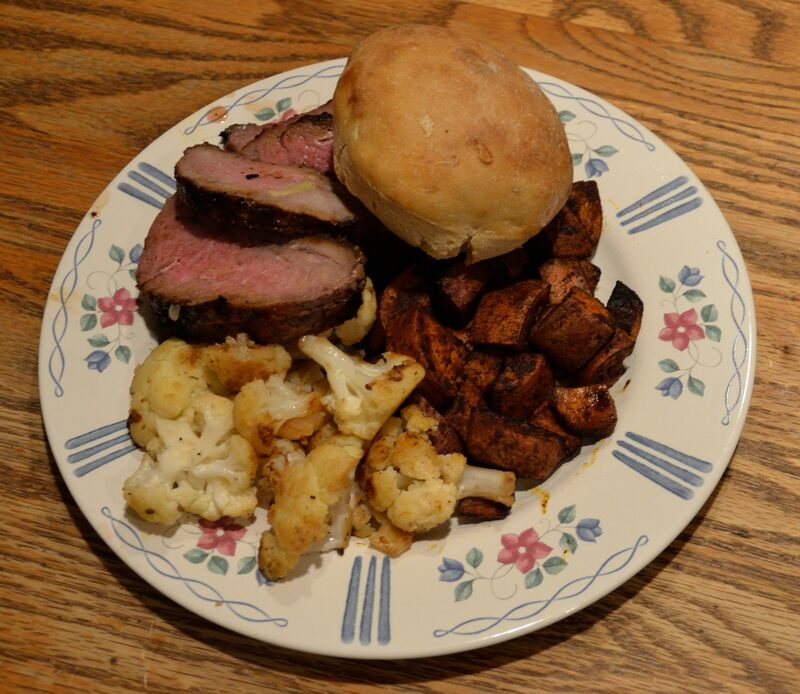 Remove tri tip and allow to rest at room temperature, covered with foil, for 10 minutes. Slice 1/4″ thick. Serve with BBQ sauce or Velda’s Gorgonzola Butter, as desired. 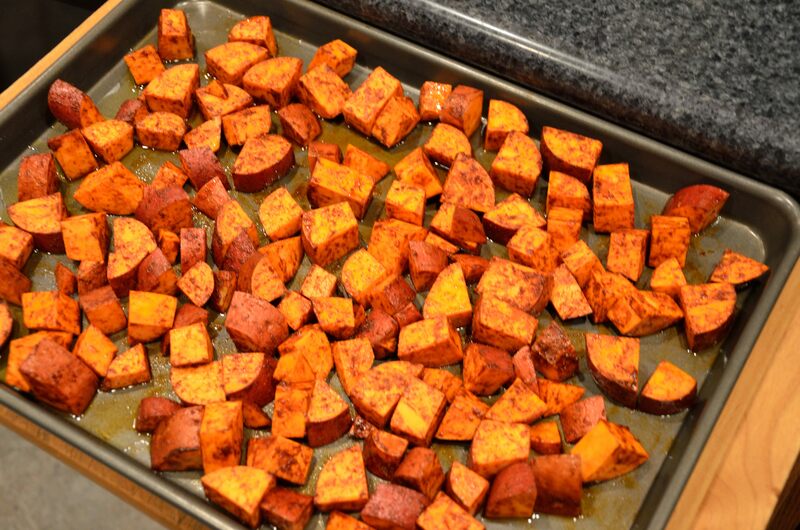 Shown here with Smoked Paprika Sweet Potatoes and Sauteed Cauliflower. 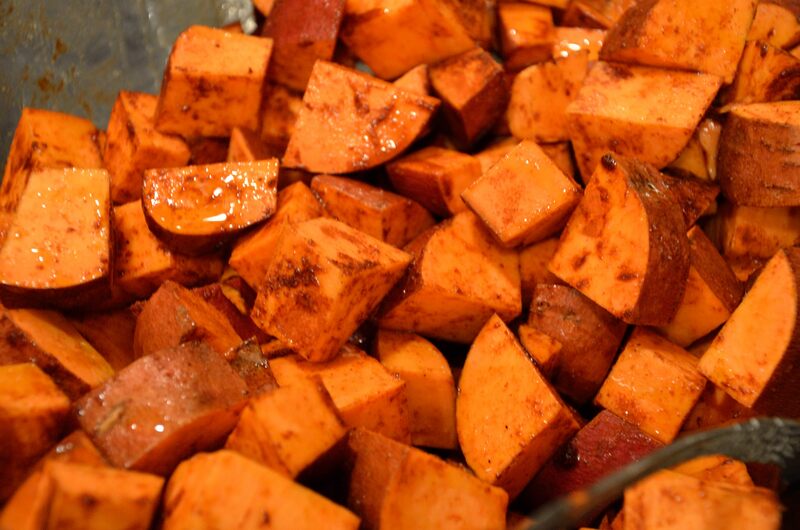 4 sweet potatoes, washed. Do not peel. 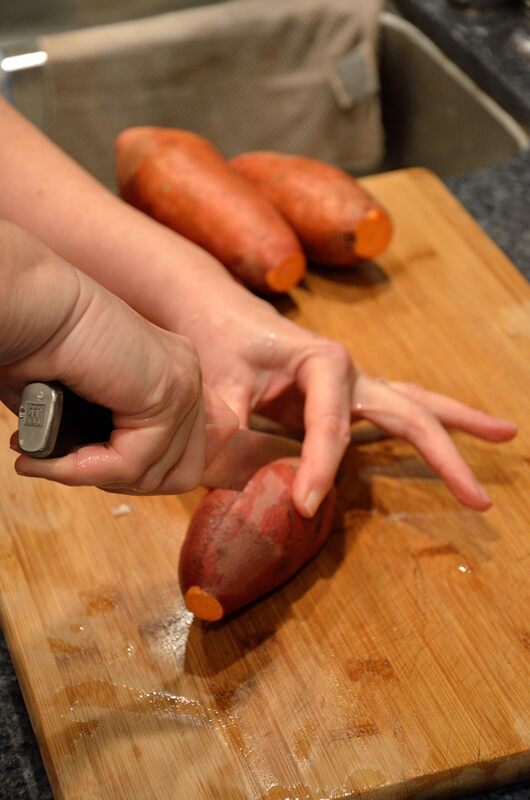 Wash sweet potatoes. Cut into approximately 1/2″ cubes. Place in bowl, toss in olive oil. 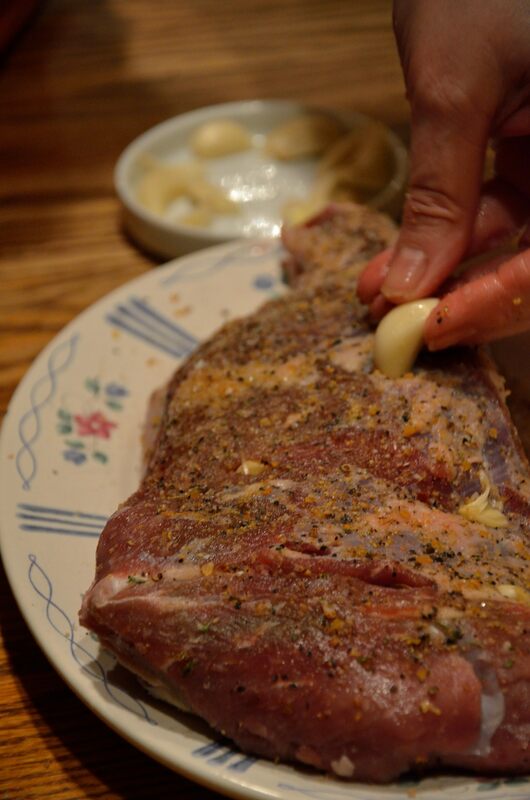 Sprinkle with garlic salt, pepper and smoked paprika. Stir until thoroughly coated; drizzle more olive oil as needed. Place on heavy cookie sheet. Bake in top rack of oven for 30-40 minutes, until edges start to brown and become slightly crisp. Stir halfway through. Wash cauliflower. Separate into florets. Slice approximately 1/2″ thick. Coat bottom of skillet with olive oil. On medium heat, add cauliflower. Season with salt & pepper. Stir to coat with the olive oil. Cook without stirring for about 5 minutes to allow edges to carmelize. Add 2 tbsp of water, cover with lid and steam for about 5 minutes, or until desired softness. Remove lid, stir. 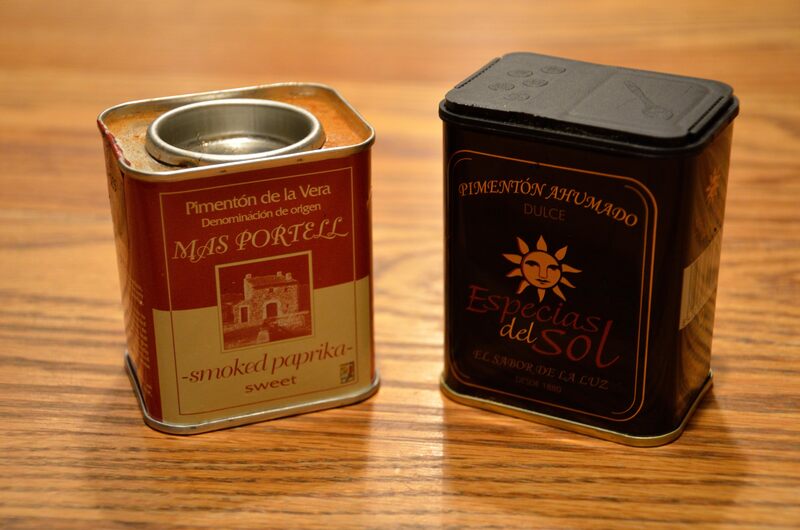 Allow water to evaporate, which allows for further carmelization. Season with salt & pepper to taste. Off to the theater in 1976. While I was single, I went on about two dozen dates. That’s right, me, more than 20 dates! I have dated girls from two different states. I have dated girls in two different cities. I have been on dates that included food and movies. Both! Two activities, one date. Is it any wonder that Velda accepted my proposal so quickly? See, I’ve been there and done that. And with cred like that, you know that I can help all of the lost souls out there that are staring at the Mount Olympus of dating in just 21 days. Gentlemen, let me help you. You’ll need to decide who you want to stare at over a chocolate dessert. Don’t worry about her looks: it’ll be dark. Do worry if she’s a criminal or lives with criminals. Choose someone who doesn’t need deprogramming. About that. Get a reservation at a dark place. Darkness is your friend. What, you think she wants to look at you? Don’t be an idiot. Don’t wait. Ask her nicely. In person. Do not text. Do not call. Ask. In. Person. Do not sing a song for your invitation, and don’t sing a song of thanks when she says yes. In fact, don’t sing. Don’t dance, either. Just avoid the arts, except for the lively art of conversation when you Ask. In. Person. A few days in advance, talk about what she’s wearing. Tell her you want to match. Give her approval over what you’re wearing. Big cred here. Don’t doubt me … look at the vintage dating photo of Velda and I. We were already engaged here … but look at how complementary our outfits are. Look at her dress. My suit. My tie. My shoes. Back in ’76, I knew how to show big style to my lady. Ditch the 7-11 roses & Wal-mart candy. You need to up your game. Bring her a potted plant. Bring her a kitchen appliance. Perhaps an emergency automobile kit. Be memorable. Wash your car. Dump the empty beer cans in the back seat. In fact, if you can borrow a car better than yours, do it. Nothing impresses a lady more than a guy that has friends or family with better cars that are available to him on demand. Call on your lady at her front door. Do not sit in the car and honk unless the lady lives behind pit bulls and a shotgun wielding Uncle. And if that’s true … you failed at # 1. If you are greeted by a roommate, parent, or sibling, be polite. Say “Good Evening. I’m here to see … (insert ‘first name’ if you are on that familiar of a basis, otherwise, it’s ‘Miss last name’).” If you are speaking to an elder, use “sir” and “ma’am.” Always. Bowing is optional. Decline any offer of water or other refreshment – it would just delay your exit. Your lady wouldn’t want to be around these people any more than you do. Open the car door for your lady. In fact, open every door for her. And don’t first clean the door knobs with an anti-bacterial wipe. You’re manly enough that your touch will kill those germs that delicate ladies must be shielded from. Lots of idiots out there on V Day. Leave plenty of time to get to the restaurant. Expect to wait. Expect to stand in line. Unless you’re paying a ridiculous amount of money to go to an incredibly expensive restaurant, you’re going to wait. Oh, and at expensive restaurants, you’ll wait even more. Put your electronics away. Turn the phone OFF. You only have eyes for her. What kind of a person looks at their phone during dinner, anyway? Geez. And if she looks at her phone … see # 13. MentalFloss.com: great water cooler chatter, delivered to your in box daily. The Art of Manliness: You’re a manly man, and this site helps you know why. But don’t talk about sports or testosterone. TheBlaze.com: Be topical – discuss gun control. Ladies love a man that likes to shoot things that annoy. Ten Best Conspiracy Theories: Chicks dig paranoia. Facebook: read all of those memes for material. Seriously, they are great humor, because everyone posts them. Love me some memes. That way, she’ll remember your first name, at least.